A client’s healthcare journey is the sum of experiences clients go through when moving from one HSP to another. Until now, this information has not been easily accessible to system planners or HSPs due to the information silos which have been created over the years. With strong privacy and security measures in place, CBI captures and reports on an entire client’s community healthcare journey and experience. Using CBI, HSPs can analyze client data, identify underlying patterns and anticipate, rather than react to, changing situations. CBI also aligns with other initiatives for a more integrated healthcare service approach. These alignments will include initiatives such as Connecting GTA, eHealth and Community Care Information Management(CIM). 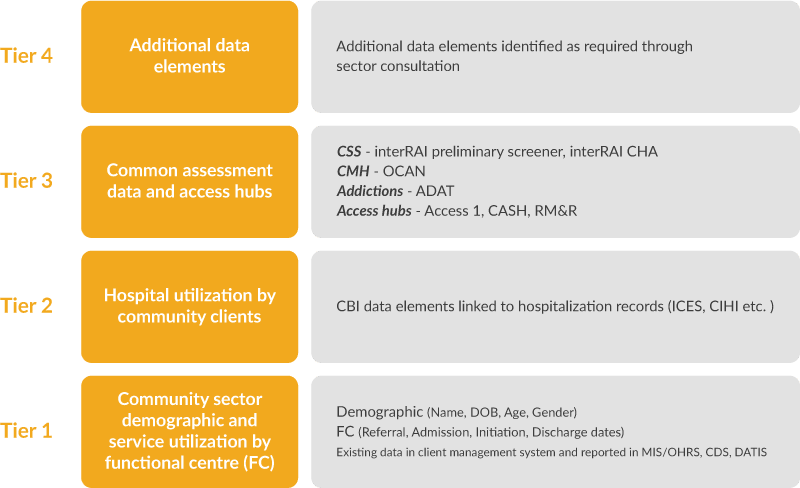 CBI delivers reporting intelligence at the individual and aggregate levels to give HSPs and the TC LHIN the ability to track client journeys across the Community Mental Health (CMH), Community Addiction (CA), and Community Support Services (CSS) sectors. Once the CBI Reference Group successfully completed their goals, a working group was formed to oversee the CBI Project. Individuals from the community sectors continue to provide guidance on the implementation of CBI. Colleen Franklin CA Transition House Inc.
A Privacy, Security and Data Access Sub-Group was established to provide support on matters relating to privacy and security, and access to CBI data. This includes documentation relating to the implementation of the Community Business Intelligence project and compliance with Personal Health Information Protection Act (PHIPA). Drug and Alcohol Treatment Information System (DATIS), identified by the CBI Working Group, is the central data repository for CBI. DATIS is Ontario’s client information system for problem gambling and addiction treatment reporting. It is an initiative of the Centre for Addiction and Mental Health. On March 31st, 2015, data from CBI was successfully sent to The Institute for Clinical Evaluative Sciences. The partnership will provide valuable information for the TC LHIN community, including how clients use primary care services. In the autumn of 2013, a test group of nine community sector HSPs and their respective vendors built and implemented the schema. From there, they tested, validated and worked with HSPs to upload client data to CBI. This was followed by a full implementation for the remaining HSPs with a client management system. Has your HSP gone live with CBI as yet? Looking for more information on CBI? Contact us today or follow us on Twitter @CommunityBI!